Season 2, Episode 48 - Christina Eanes Dan Sterenchuk and Tommy Estlund are honored to have as our guest, Christina Eanes . 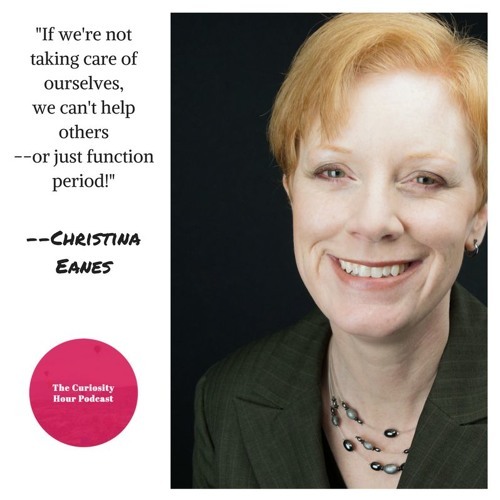 Christina specializes in superachieving and it is her personal mission to help individuals achieve more in life. She accomplishes this mission through her speaking engagements, workshops, and coaching. To learn more, visit ChristinaEanes.com. In addition, she has published a series of books, blogs, and a podcast series, all of which can be accessed at QuitBleepingAround.com. Prior to small business ownership, Christina spent over fifteen years in public service with a police department in California and the FBI. During this time, she worked on a variety of programs including the FBI’s Violent Criminal Apprehension Program where she analyzed serial homicide and sexual assault cases in conjunction with state and local law enforcement officials, and the FBI’s Leadership Development Program where she led a team of facilitators to improve and shift the management culture in the Bureau. Christina has a B.S. and M.S. in Criminal Justice Leadership, an M.S. in Education with a specialization in Training and Performance Improvement, and is a Certified Professional Co-Active Coach (CPCC). The Curiosity Hour Podcast is hosted and produced by Dan Sterenchuk and Tommy Estlund. Please join our Facebook Group, The Curiosity Hour Podcast, to continue the discussion about this episode online: www.facebook.com/groups/thecuriosityhourpodcast/ Disclaimers: The Curiosity Hour Podcast may contain content not suitable for all audiences. Listener discretion advised. The views and opinions expressed by the guests on this podcast are solely those of the guest(s). These views and opinions do not necessarily represent those of The Curiosity Hour Podcast. This podcast may contain explicit language.